Since going wheat-free on doctor’s orders a few weeks ago, I’ve been trying to negotiate my way around the quagmire that is baking without wheat flour. I started by heading to Whole Foods, convinced I would find a wealth of delicious wheat-free flours and start whipping up delicious cakes straightaway. This foolhardy optimism was brought up short when I stood in front of their wall of self-service flour and started to cry. I’d just been looking through gluten/wheat free cookbooks in Waterstones and it had dawned on me just how many different types of flour are often required for one recipe. I’m talking about a cup of sorghum flour here, maybe half a cup of brown rice flour there, a cup of almond flour, oh and a few tablespoons of ground brown flax seeds (ever heard of those? no? me either), all within the same recipe. It left me pining for just one shining bag of self-raising. But, having pulled myself together by the dried mangoes with the help of a hug from D, I decided to leave the Whole Foods jungle and start simple. I did some digging around at work and found a few wheat free recipes I liked the sound of – chestnut pancakes with chocolate and prunes, peanut butter and chocolate cookies and this almond cake. When I was little, I remember quite clearly polishing off almost an entire batch of my mum’s almond biscuits. Out and about on the farm, I was always active and always hungry – much as I would like, I don’t go around eating whole batches of biscuits these days. But, the point about these biscuits was how very almondy they were. 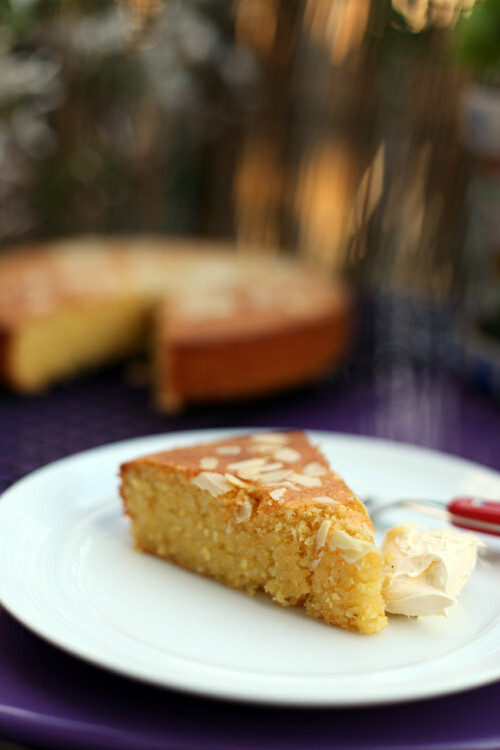 So buttery and with this pure, almost addictive almond flavour. I find very few almond biscuits or cakes match those biscuits for strength of almond flavour, softer than marzipan and with a warmth imparted by a freshly-baked crumb. The joy of this cake is that not only is it wheat-free, it has transported me straight back to the flavour of those biscuits, hot from the oven. I tweaked the recipe to add some mascarpone and a tablespoon of cream cheese and it worked very well. Baking, eating and serving this cake to friends has felt like a small victory in my transition to wheat-free. Onwards and upwards. You’ll need a 23cm (9 inch) round springform cake tin, greased and lined. Start by preheating the oven to 160 degrees centigrade (325 degrees fahrenheit/Gas 3). Cream the butter and sugar together with an electric whisk until very pale and fluffy. Beat in the eggs. I do this very gradually, beating the eggs on their own light first, then adding small glugs and whisking on the highest speed to avoid curdling. Mix together the ground almonds, polenta and baking powder. Add half to the mixture along with the yoghurt and whisk in. Finally, whisk in the remaining dry ingredients, the mascarpone and cream cheese. Dollop into the tin and even out the surface, then scatter over the flaked almonds and bake in the oven for 1 hour. Check after 50 minutes. A skewer should come out clean. Cool in the tin for 10 minutes then on wire rack. When stored in a tin, this cake just gets better with age. It will keep for up to two weeks. 09 Jun	This entry was published on June 9, 2013 at 8:45 pm. It’s filed under Perfect with tea, Recipes and tagged almonds, cake, gluten free, polenta, wheat free cake. Bookmark the permalink. Follow any comments here with the RSS feed for this post. I see that you’re new to wheat-free eating, so I’d like to pass on a website to you that you may find useful. I don’t have celiac or a wheat sensitivity that I’m aware of, but I know a lot of folks who do, so I like to know where I can find recipes they can eat.